Are these nasty pests devouring your favorite flowers and plants this summer? Here’s what you can do to stop them. Every summer, questions pour in to us regarding the Japanese Beetles that are voraciously devouring people’s flowers and plants. It’s quite obvious these little buggers are the culprit. Their ¼” long bodies are easy to spot and since they are very slow moving, you’ll likely catch them in the act. Their shiny metallic green and copper shells glisten in the sun like rare jewels but beauty can be deceiving! They don’t seem to care a bit that they are destroying our favorite roses, hibiscus and clematis flowers. Japanese Beetles are a major summer pest throughout the Central, Midwestern and Northeastern United States and Canada. They live as grubs in your soil from fall through winter, then emerge as beetles between early June and late August. Your local extension agent will have more specific information for the timing of Japanese Beetles in your area. Once they emerge as beetles, they chew large holes in flowers and foliage to the point where they will even eat every last leaf off of the plants they love. Members of the Rose family are their favorite targets. As is the case with most pests, there are a variety of ways to try to control Japanese Beetles. Focusing on prevention is key since their hard shells make them tougher to kill once they have turned into beetles. Here are a few things you can do to control Japanese Beetles in your garden. Before Japanese Beetles emerge, they are grubs that live under your lawn and in your garden beds. So prevention means getting to the grubs before they can grow up into beetles and spread all over your garden. There are lots of options for controlling grubs. The following can be purchased at garden centers or online. Grub-eating Nematodes (Heterorhabditis bacteriophora) – These beneficial nematodes find grubs in the soil and kill them. Bt (Bacillus thuringiensis) - Bt is a naturally occurring soil bacteria that eats Japanese Beetle grubs before they can develop into beetles. Milky Spore (Bacillus papillae)—This bacterium takes 2-4 years to become established in the landscape but then offers continuous protection from Japanese Beetle grubs. This method is not for the squeamish! Most people don’t want to touch bugs, but Japanese Beetles do not bite and you can pick them off plants and either bag them or drop them into a bucket of soapy water to get rid of them. It is easiest to do this early in the morning before the beetles wake up and start moving. There are traps you can buy at home improvement stores which are made especially for Japanese Beetles. The way they work is by luring the pests into a small container from which they cannot escape. This can work to help reduce the beetle population, but don’t leave the trap out all the time (maybe just a day or two a week) as it will attract all the local bugs to your garden and that can be a LOT of beetles. Since the beetles may feed on nearby plants before entering the trap, do not set the trap out near your favorite plant. Instead, place the trap at the edge of your yard away from the plants the beetles may damage. Make it a neighborhood effort as traps become more effective if there are many scattered throughout the area. Select chemicals can be effective at controlling Japanese Beetles. Least toxic to humans and pets are the Pyrethrin class of insecticides which are safe to use on vegetables, grapes, raspberries, flowers, roses, trees and shrubs but can be very bad for fish, so avoid using them around ponds. Another low toxicity control method is applying Neem Oil as a spray as soon as the beetles appear in your garden. Neem Oil can help control Japanese Beetles, Cucumber Beetles, Flea Beetles, Cabbageworms, and Colorado Potato Beetles. Japanese Beetles seem to try a taste of just about everything in the garden, but there are actually a select group of woody and herbaceous plants that they typically leave alone. Consider this list when adding new plants to your garden if you are plagued by Japanese Beetles. Of course the beetles just love Asiatic Lilies. Several years ago a client at a garden centre came in looking for white geraniums to plant in between her lilies. Apparently the beetles are attracted to white (even though they will eat everything in sight no matter what colour or type of plant it is) and there is some kind of agent in the geraniums that will paralyse the beetles until a predator carries them off. The first year we had the beetles attacking our lilies we were unable to find white geraniums so we took a chance that another colour would work just as well and to our amazement the beetles disappeared and the lilies remained beautiful. You don't need a lot of geraniums just one here and there. 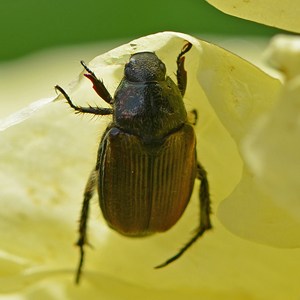 Don't get too fond of the geraniums, however, because the beetles will destroy them in the process. An internet searche for "Japanese Beetles and Geraniums" will provide more scientific information. Which method of controlling Japanese beetles is most cost effective for those of us with some acreage? Bt, milky spore, or the grub eating nematodes? Sorry I don't have an answer for that. They say the best control is to treat them in the grub stage. Here is a link that maybe helpful or check with your local master gardeners extention.